Immunohistochemistry is the use of specific antibodies to stain particular molecular species in situ. This technique has allowed the identification of many more cell types than could be visualized by classical histology, particularly in the immune system and among the scattered hormone-secreting cells of the endocrine system, and has the potential to improve diagnosis, prognosis and therapeutic options of cancer. 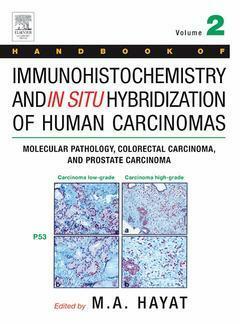 This book discusses all aspects of immunohistochemistry and in situ hybridization technologies and the important role they play in reaching a cancer diagnosis. It provides step-by-step instructions on the methods of additional molecular technologies such as DNA microarrays, and microdissection, along with the benefits and limitations of each method. The topics of region-specific gene expression, its role in cancer development and the techniques that assist in the understanding of the molecular basis of disease are relevant and necessary in science today. This book is the second volume of three planned, individually-sold volumes on this topic. Like Volume 1, this book fully explains the principles and applications of modern techniques used in the field of molecular genetics. It will be of particular interest to pathologists and molecular pathologists conducting both academic and/or clinical research. Graduate and medical students in cancer research, oncology, pathology, biology, immunology, bioinformatics and endocrinology.